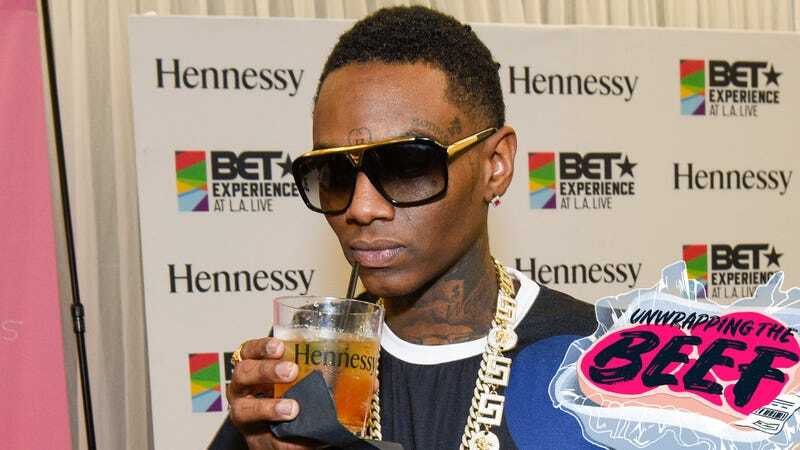 Why Is Soulja Boy's Beefing With Drake, Tyga, Kanye West? Soulja Boy, ever the voice of reason, has had an absolutely wild week, and we thank him for all the memes. In a series of videos and interviews, he’s gone after Drake, Tyga, Kanye West, alleged abusers like Famous Dex and 6ix9ine, and probably a bunch of other people—honestly, it’s hard to keep track. But if you’d like to try, here’s a guide to the past few days in Young Drako (that’s what he’s calling himself) and his war against everyone. Quick, let’s unwrap this beef before he goes live on Instagram again, shall we? First, it helps to know what Soulja Boy is mad about. His primary argument is that he had “the biggest comeback of 2018” (where did he go exactly? ), and that many rappers have copied his style. According to Complex, he kicked off his week with an Instagram livestream (of consciousness?) rant. It began anti-Kanye and ended pro-Kanye, complete with a request for fans to send him money. Here’s where it gets juicy: Soulja Boy came after, well, everyone in an hourlong, ridiculously quotable interview on The Breakfast Club. 6ix9ine isn’t nothing but a Soujla Boy child. What&apos;s Going On With Cardi B and Makeup Artist Blacswan?